In the wake of a recent post on St. Martin de Porres, which included a discussion of the Tertiary (“Third Order”) habit that the oldest painting of his shows him wearing, a commentator asked when the Holy Rosary became an “official” part of the Dominican habit. This seemed an easy question to answer, but it proved more complicated. The first thing I did was to look in the most recent version of the Dominican Constitutions (2014), appendix 3, which describes our habit. It says absolutely nothing about the Rosary. Perhaps then, the Rosary was dropped after the major revision of our Constitutions in 1968. I checked there in appendix 3: nothing on the Rosary. But my quandary was resolved by a message from Fr. Martin Wallace, ho called my attention to n. 50 of the 1969 Constitutions which says. "The habit of the Order consists of a white tunic with a white scapular and capuce, with a black cappa and capuce, a leather belt and rosary." And so n. 50 reads for all revisions of the Constitutions up to the present age, even though Appendix 3 in each addition never mentions it. This legislation is virtually identical to that no n. 601 of the Pre-Vatican-II constitutions of 1954 and 1932, although these specify that the Rosary is to hang from the belt. These norms descend from n. 892 of the 1924 Constitutions, which mentions the Rosary but says nothing of where it is worn. And this legislation is the first official entry of the Rosary into the Constitutions as part of the habit. 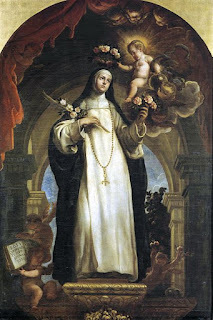 It was undoubtedly introduced as part of the reform of the older law (as witnessed in Jandel) in the wake of the new Code of Canon Law in 1917.So the Holy Rosary has been an official part of the Dominican Habit since the promulgation of the revised Constitutions of 1924. In the thirteenth century, the practice of reciting set numbers of Pater Nosters (Our Fathers) was already a popular lay devotion. I have collected examples of this from the lives of Italian saints and blesseds of the period in my book Cities of God. 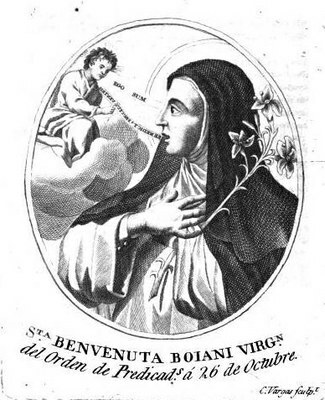 My favorite is the Dominican blessed, Benvenuta Bojani (1254-1292) From the age of seven to twelve, she said 100 Paters and Aves daily, doing 100 prostrations in honor of the Lord’s Nativity and a second 100 prostrations in honor of his Resurrection. To this she later added 1000 Aves in honor of the Blessed Virgin, except on Saturdays, Our Lady’s special day, when she doubled the number. So she was not only saying Paters but also Aves. In our primitive constitutions (ca. 1220), the conversi or lay brothers (now called cooperator brothers) were required to say set numbers of Paters for the various canonical hours, which they could not sing with the clerics because they normally were illiterate and had manual labor to do to support the community. But in 1252, the Provincial Chapter of Dacia, held at Lund in what is today Sweden, made the first attempt to add a 100 Aves to the 100 Paters lay brothers said in their suffrages for dead. This did not last, but by the early 1300s, 100 Paters and Aves had became the conversi suffrage for a dead member of their community. Then, in 1366, the General Chapter at Rome first added Aves to all Paters that the convesi said instead of the Divine Office. After some back and forth, this practice was finalized by the early 1400s. But none of this was the “Dominican” Rosary as we know it, with 15 decades of 1 Pater, 10 Aves, and a Gloria Patri. As far as we can tell, that form, with a set of 15 mysteries to meditate on, first appeared in the writings of Dominic of Prussia (1382–1461), a Carthusian monk. So, the custom of wearing the Rosary has to date after the mid-1460s. Famously, Bl. Alan de la Roche, O.P. (d. 1475) promoted the devotion to the Rosary throughout the last 16 years of his life, preaching and writing about it. In 1470, he founded the Confraternity of the Most Holy Rosary. Later legends (recorded only after his death) ascribe to him visions of Our Lady, the Rosary, and St. Dominic, supposedly dated to about 1460, so the earliest date for Dominican habit Rosaries would be the late 1400s. 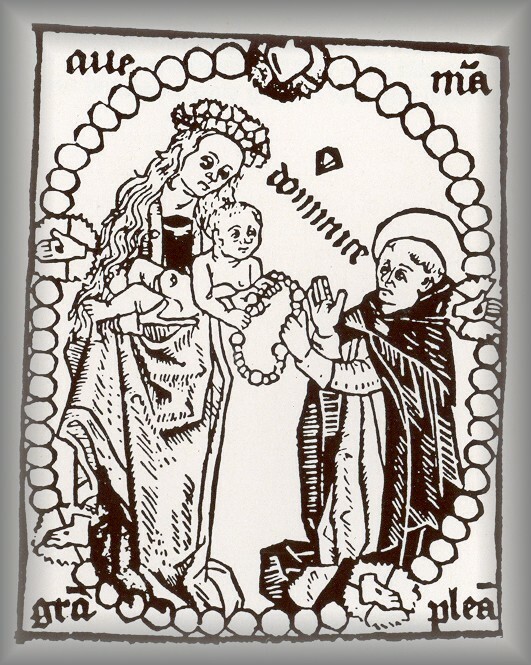 And, indeed, the earliest image I know of showing a rosary is a woodcut dated to that period. It also shows Dominic, though not wearing it, and I reproduce it here. There is nothing that I have found that indicates any Dominican wearing of, or legislation on, the Holy Rosary, however, for another 100 years. By then, I understand that in the 1540s, Fray Domingo Betanzos, O.P. 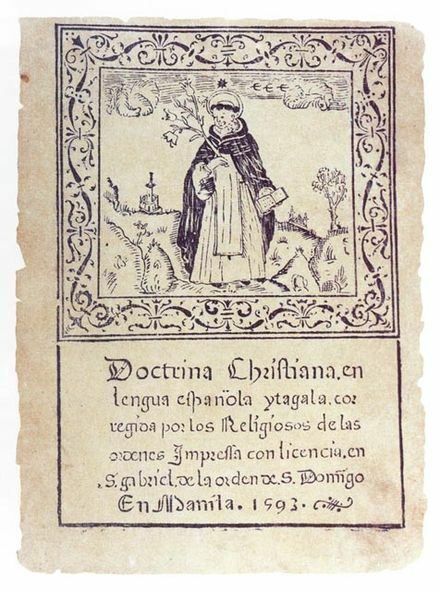 (d. 1549), first provincial of the Dominican province of Mexico, required friars of that Province to wear a Rosary around their necks. This practice would then spread with Spanish Dominicans to South America, and eventually to the Philippines and the Far East. This is the first example of wearing of the Holy Rosary with the habit, although it is not universal and not on the belt. On September 1569, the Dominican Pope, Saint Pius V, acknowledged as a “pious belief” the legends linking Dominic and the Holy Rosary, usually connected with Alan de la Roche, in his bull Consueverunt Romani Pontifices, which also granted indulgences for those saying it and meditating on the mysteries. Then in 1571 comes the first-known mention of the Rosary in any legislation of the Order as a whole The General Chapter at Rome in that year urged the promotion of the Rosary in preaching. This is not surprising, as that was the year of the great victory over the Muslim invasion of Christian Europe at the Battle of Lepanto, a victory that Pope Pius ascribed to praying the Rosary. By 1583, however, the General Chapter at Rome first mentioned the recitation of the Holy Rosary in an ordinance of the whole order; it allowed lay brothers and Tertiaries (conversi et seculares) to replace the 100 Paters and Aves in suffrages for the dead with five decades of the Rosary. In 1596, the order gave the title “Our Lady of the Holy Rosary” to the new province of the Philippines and the Orient. However, I find no evidence that the Spanish Dominion practice of wearing the Rosary around the neck had spread any beyond the Spanish missions. 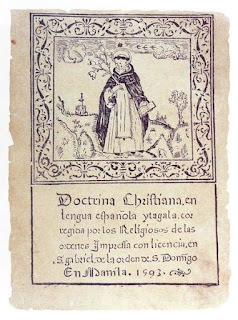 In 1593, for example, a title page of Spanish catechism still shows St. Dominic without any habit Rosary, as you can see to the left. 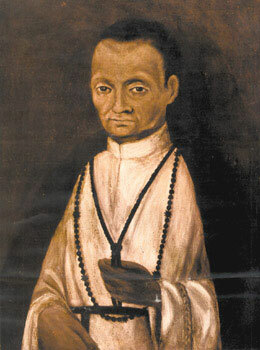 Nevertheless, as is clear from the image of the elderly St. Martin de Porres I featured in my earlier post that, in the Spanish Dominions at least, the wearing of a Rosary around the neck had become common, even customary. 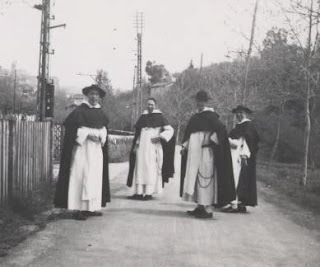 Then, in 1670, at the Rome Chapter, the daily recitation of the Rosary in choir by all friars, priests as well as lay brothers, was mandated, a requirement that remains to this day when not impeded by pastoral responsibilities. Artistic evidence in the later 1600s suggests that it is in that period that the wearing of the Rosary, now on the belt, finally became a “universal” custom. It is very difficult to trace the introduction of customs, but artistic representations are usually a good indication, and it is in the 1660s and 1670s, that artists first begin to portray Dominican saints wearing a Rosary. 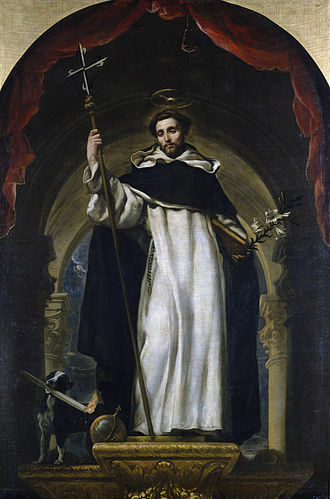 A good example from this period is the painting to the right by the Spanish late-Baroque painter Claudio Coello (1642–93), which shows St. Dominic wearing the Fifteen-Decade Dominican Rosary. I do not claim that this is the earliest example of this iconography, only the earliest I have found. If a reader knows of a dated earlier example, I would be happy to add it to this post. It is interesting that the same artist knew that St. Rose of Lima (1586–1617) would have worn her Rosary around her neck, as that was the practice among Dominicans in Peru during her time. This, even though he has all the rest of her dress incorrect, painting her in the habit of a cloistered nun, rather than in the Tertiary habit she would have worn, with a white veil, no scapular, white tunic, and black mantle. So, my conclusion is that the custom of wearing a habit Rosary become more or less universal in the late 1600s. It certainly was so by the 1700s, as I know of no images of Dominicans from that century or later without it. If, however, anyone knows an image of that late date showing a Dominican without a habit Rosary, let me now and I will add it to this post.